how to send form for upload by email? Hi! I'm looking for a service for my customers. They need to upload small files for me but I don't want put your form on my website. I prefer send them this form by email. How it is possible? Please show me the way because I spent already over 3 hours and didn't find a solution. 2. 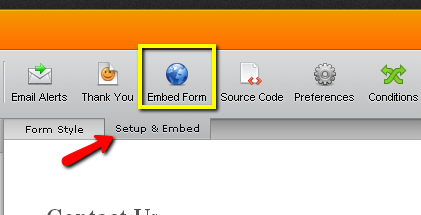 Click on Embed Form. 3. 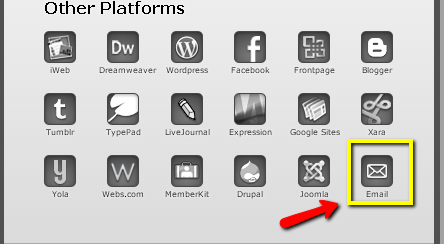 Choose Email option under Other Platforms label. 4. Then fill out the information an click on Send Email button to send your form. And that's it, your form is sent. Hi. This is only a link to the form. I would like to form to be IN the e-mail body, so they can just fill it and click send without having to go to a web page. 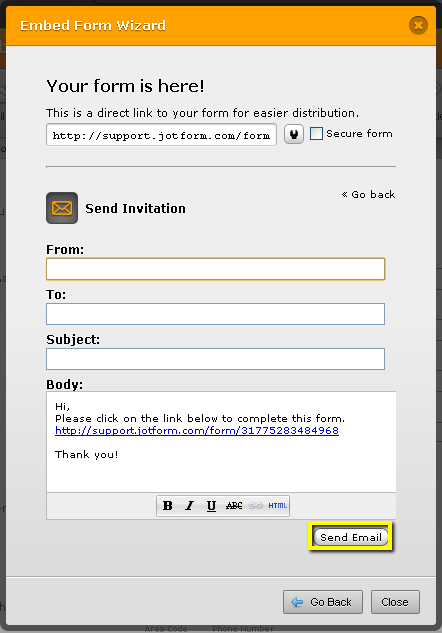 Please post your question in your own original thread: http://www.jotform.com/answers/244552-include-form-in-an-e-mail?entrymessage=10732640770. This thread was given just as a reference for a possible answer, we will be answering to you in your own thread.